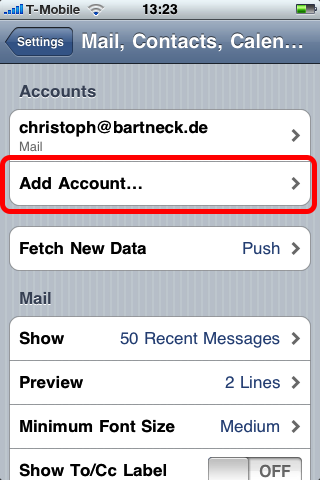 Synchronizing your iPhone with the TU/e Exchange server | Christoph Bartneck, Ph.D. This tutorial will show you how to synchronize your iPhone’s calendar, email and contacts with your Exchange account at the Eindhoven University of Technology (TU/e). It does not matter which way you are connected to the internet, but you may want to read how you can connect to the wireless network of the University. 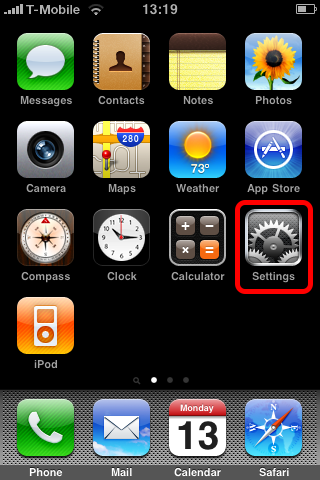 You may also connect through the wireless network at home, or outside through the T-Mobile telephone network. This tutorial assumes that you are currently connected to the internet. 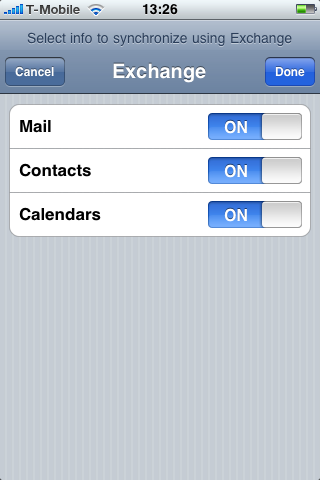 Tap on the Mail, Contacts, Calendars row. Tap on the Add Account row. Notice that I already added a private email account. However, you can only synchronize with one Exchange account. 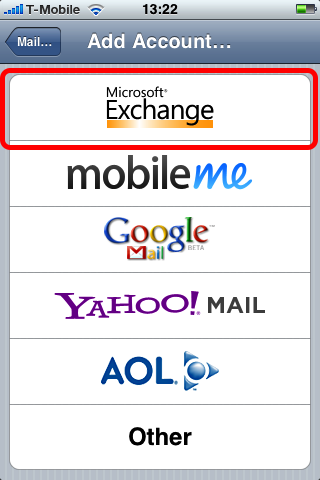 Tap on the Microsoft Exchange row. 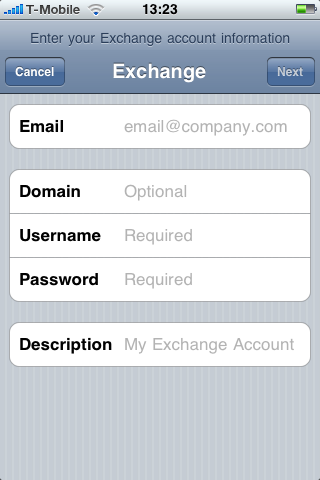 Add your TU/e email, username and password. Then tap on Next. 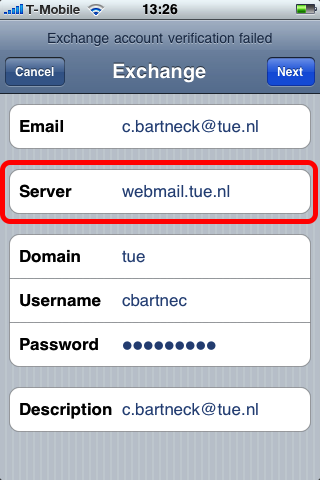 Use webmail.tue.nl as the Server. Please ignore that this screenshot says that the verification failed. It should of course succeed. Then tap on Next. Choose what you want to synchronize and tap on Done. The new Exchange account should now show up in the list. should this also work for student email accounts? the tue server was down. Thanks for making it so easy for me. 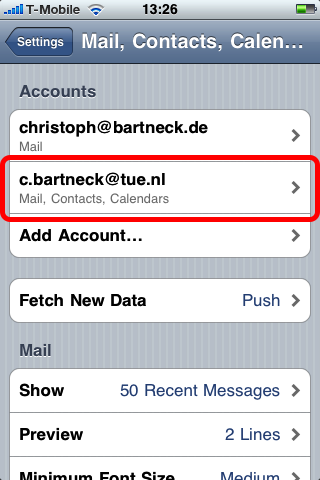 Is push email available on the iPhone in combination with the TU/e network? And is it possible to send e-mail from my TU/e account on the iPhone when I am not at campus, because on my Macbook I have to make a VPN connection. Thanks in advance. You can send emails, even if you are not at the campus. Thanks a billion…it really helped! I think they must’ve changed the settings because I can’t get it to work. It keeps returning the message “Can’t check the account details” (this is a rough translation from the dutch message: “Controle accountgegevens niet mogelijk”). Do you have any help? I am no longer at TUE and are therefore not able to help with this. Please post the solution if you find one. For some versions of Android webmail2007.tue.nl should be used. Don’t know if this also holds for iPhone.